Our carbon filament or carbon heater lamp is an exact replica of the original 1900's lightbulb, the first ever electric lightbulb as invented by Joseph Swan the British inventor and scientist. Lamps-on-line.com have been working with a supplier to replicate exactly the original filament so that the aestheticaly pleasing warm "glow" of the original 1900's bulb is maintained. Carbon filaments where originally made by dipping silk in a liquid carbon mix in a similar way to how candles are produced, to make the filament. The filament was then wrapped around a mandrel that gives it the attractive ringed filament shape. When a current is passed through the filament it is illuminated creating a warm cosy light the type that is now very popular in restaurants and bistro's all over the UK. At lamps-on-line.com we found a corporation in Japan that had the facility to make an original carbon filament for us, the filaments are then passed to the bulb manufacturer who manufacturers the final product for us. We have even got the original "pip" added to the top of the lamp to recreate the sealing of the vacuum tube as in the original construction. 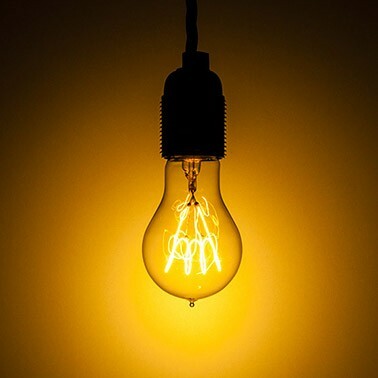 It is important to know that our bulb uses an original carbon filament that is essential in creating the "warm glow" from the filament, a regular tungsten filament as used in the production of household lamps would not be able to create the same effect. The carbon filament bulb complements perfectly our range of Squirrel cage lightbulbs in ST64 and 120mm globe shapes. The aesthetic appeal of the carbon filament lamp gives the lightbulb a desirable look and alse creates a warm atmosphere wherever it is used.